The Hay Pillow® product line includes the popular Standard and Mini Hay Pillows which are heads down the best slow feed choice. The only slow feed hay bags designed for use on the ground with a solid back; allowing your horse to eat in a natural grazing position and encourage movement! Why is feeding my horse from ground level best? 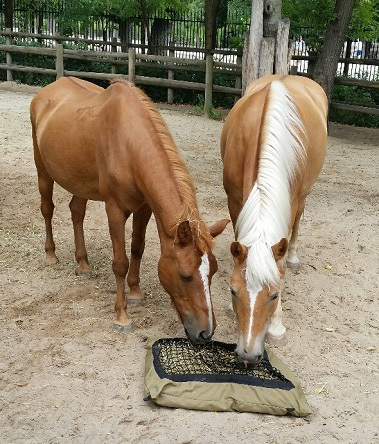 The Hay Pillows® ensure that your horse has a continuous supply of hay available to them without over-eating. By having to work for each strand of hay your horse will be able to regulate his eating and will chew thoroughly so that the hay will be properly digested. This mimics the way horses eat in the wild - a slow, continuous amount of food over a 24 hour period. The custom nylon (DuPont®) knotted netting is available in five mesh sizes: ½”, ¾”, 1”, 1 ¼” and 1 ¾ ”. The 1 ¼” and 1 ¾” are the most popular mesh sizes. Going too small, too quickly can frustrate your horse. 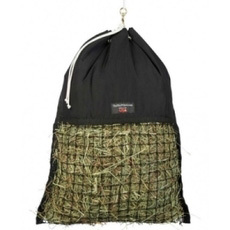 The Hanging Hay Pillow® is a great choice if you need to hang a bag. It is designed to be hung as low as possible with the netting area at the bottom to encourage a head down eating position. Great for the horse trailer too! The Standard Hay Pillow® is 32” x 27” and holds up to 8lbs of hay. 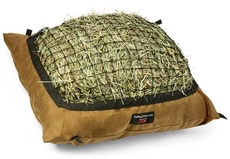 The Mini Hay Pillow® is 23” x 19” and holds up to 2lbs of hay. The Hanging Hay Pillow® is 36” x 28” and holds up to 8lbs of hay. 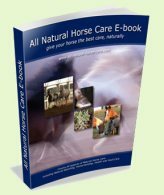 "the key to having physically and mentally healthier horses"